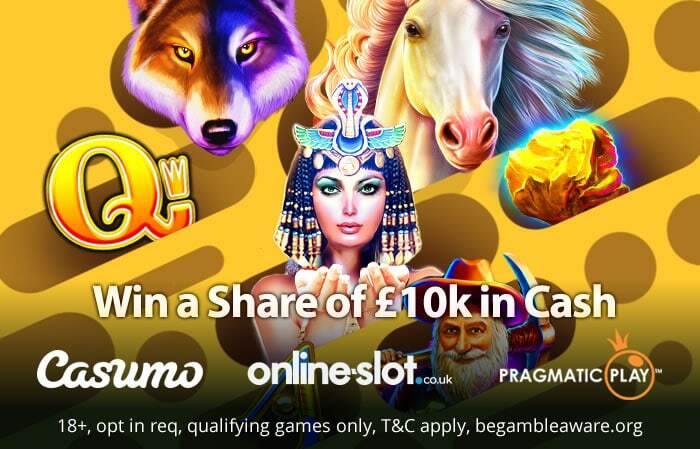 Customers at Casumo Casino can go for gold over the next few days and try and land a share of a £10,000 prize pool courtesy of the Golden Cash Drop Giveaway. A total of 78 prizes worth between £50 and £1,000 will be awarded between now and the 14th of April 2019 – that’s tomorrow by the way. All you have to do to be in with a chance of winning one is opt-in then get spinning on 1 of the following slots from Pragmatic Play: Mustang Gold, Wolf Gold, Queen of Gold and/or Gold Rush. Cash prizes will be credited to the winners’ accounts within 48 hours. They don’t come with any wagering requirements. Our pick of the 4 qualifying slots is Mustang Gold, a 5 reel, 25 payline slot. This Wild West adventure might not be the most visually arresting slot you’ll see. The pair of bonus features make it well worth a spin though. Landing a horse shoe symbol plus the sheriff’s badge collect symbol on reel 5 triggers the award of the cash amount shown on the horse shoe(s). This comes on top of any standard wins you’ve landed on that spin. Better still is if you land the jackpot horse shoe and the collect. This activates the bonus round. Choose from the horse shoes until you land 3 that match. Prizes on offer here are 50, 100, 200 or 1,000 times your stake. The main feature awards 8 free spins. Extra wilds and scatters are in play here to increase your chances of creating a winning combination or triggering a bonus or jackpot round. There’s up to 12,000 times your stake to be won from each free spin! If you like the cowboy theme, then this trip to the rugged American West should offer plenty of appeal.